This was particularly noticeable in the stretch swing passage. 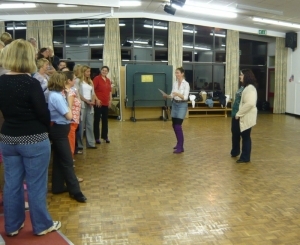 If people mime the stretch without muscular engagement, you get singing that is in time - a good start, but only a start. We played with how it would feel to stretch one rubber band, then two, then four - and as the imagination conjured up the differences in each case, the physical act of stretching became far more realistic. And that in turn produced not only a greater depth an continuity of resonance through the extra vocal support, but a sassier, brassier vocal colour that matched the body language. We then delved into more detail, in particular into making use of embellishments, individual harmonic colours, and - such a simple but vital musical element - the long notes. If you are given a long note to sing, the only reason is in order to show off the beauty and communicative power of your amazing voice. And this fact always dovetails with the expressive purpose of the lyric. Whoever a song is addressed to - and songs pretty much always have either a present or imagined interlocutor - the more you commit to singing right through the phrase, the more chance you have of convincing them of your message. In speech we don't dwell on the sound of the vowel; we think in units of meaning, phonemes building into morphemes. In song, we add emotional truth to linguistic meaning by staying present in the sound and following it through. If you just leave a long note lying there like a dead fish on the pavement, you lose your hold on the attention of the song's addressee (and indeed on the attention of your audience). We need to sing notes as waves as well as particles. Melodic continuity works a bit like eye contact in this sense. If you're talking to someone, but your eyes flick away part way through the sentence, they feel that you're distracted, not really engaged in the conversation. If you hold them with your attention so they can't disengage, they are far more likely to believe what you say is important. And it's noticeable how singers become so much more visually compelling once they commit vocally to staying present right through the long notes, right through the phrases. As I drove home, I reflected that the reason I like this approach of exploring the relationship between musical detail and lyrical narrative/characterisation is because it builds the Communicator in at the heart of the performance. You find yourself remembering to use a certain colour or volume or articulation at a certain point not because it is part of a 'plan', but because it is integral to the dramatic trajectory of the song. It becomes much easier to relegate the Manager to a trouble-shooting role when your internal map of the performance is built on an understanding of and empathy with its musical and human narrative.